Water must become a consistent priority in U.S. foreign policy. Handled properly, water can be a critical element in support of democracy and prosperity, at home and abroad. Safe and reliable water supplies are a foundation for resilient livelihoods, public health, and educational attainment, particularly for girls and young women. Good water governance, in the form of community-based natural resource management and other participatory mechanisms, can be a powerful democratic experience for millions of people. And water demands cooperation across all sorts of social and political boundaries, creating interdependencies that can be used to build trust, deepen understanding, stabilize relationships, and contribute to sustained peace. Water is also a priority because the failure to address pressing water challenges can have dire consequences: political and economic instability, livelihood- and health-related vulnerability, and irreversible damage to critical ecosystems. The resulting demands for action may tax or exceed the capabilities of fragile states. In extreme circumstances, water can be a trigger or threat multiplier for violent conflict. Several accelerating drivers – including climate change, urbanization, and changing patterns of municipal and industrial demand – are combining to create significant adjustment challenges for water systems, today and in the years ahead. The 2014 Paul Simon Water for the World Act calls for “promoting the maximum impact and long-term sustainability” of water, sanitation, and hygiene-related (WASH) projects and programs. 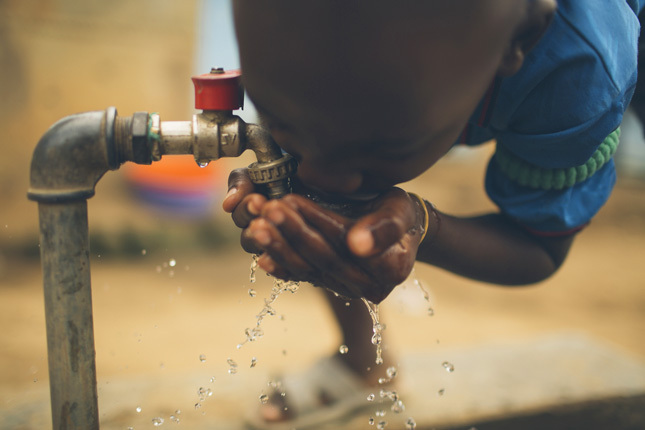 For most countries facing WASH challenges, the UN Sustainable Development Goals – and specifically Goal 6 on water – have become the focal point for these efforts. SDG 6 is vastly improved over its predecessor, the Millennium Development Goal on water, which focused narrowly on supplying drinking water and sanitation. SDG 6 adds three critical themes: first, reducing pollution, protecting watersheds, and safeguarding the freshwater ecosystems on which sustained supplies of safe water ultimately depend; second, building capacity for water reuse, rainwater harvesting, and wastewater treatment; and third, strengthening the participation of local communities in water decision-making. All WASH-related efforts supported or funded by the United States should be screened for consistency with these three provisions of SDG 6. The United States should aid and encourage governments to establish, execute, and document participatory processes that ensure citizen access to information, participation in decision-making, and opportunities for redress. The U.S. should promote the inclusion of evidence regarding effective citizen participation as a “best practice” in international reporting, including for the Voluntary National Review process under the Sustainable Development Goals and the Nationally Determined Contributions and National Adaptation Plans of the UNFCCC. U.S. policy should be proactive in defending environmental and human rights advocates who work for equity in water access and openness in water decision-making. According to Global Witness, an average of two environmental advocates are killed each week for defending lands, waterways, forests, and other community natural resources against encroachment, pollution, or destruction. This rate is roughly equal to the number of journalists killed in the line of duty. Almost 80 percent of documented killings over a 10-year span took place in five countries of the Americas: Brazil, Honduras, Peru, Colombia, and Mexico. The United States should (i) work through the Organization of American States to see that states comply with the UN Human Rights Council’s recent resolution on protecting human rights advocates; (ii) strengthen the Inter-American Human Rights Commission’s ability to exercise its mechanism for emergency protections and precautionary measures; and (iii) encourage other regional human-rights adjudication bodies to adopt similar protocols for proactive protection. The United States should use its assessment and reporting commitments under the Sustainable Development Goals as an opportunity to map its own extra-territorial water footprint, assessing the impact of U.S. foreign investment, trade, and development assistance activities on water supplies and water access beyond U.S. borders. The U.S. should seek to be a world leader in the development of methodologies for identifying such transnational effects as a way of monitoring progress toward the SDGs, which now apply universally and not just to less-developed countries. The United States should engage in and promote disaggregated data collection on water access and water outcomes. Such data are essential to identify and monitor disparities by gender, locale, income level, ethnicity and other key dimensions, and to hold programs accountable for their results. There are an estimated 276 international river basins that form or cross national borders. One-third of the world’s population lives in these basins, and 60 percent of the world’s freshwater supply is derived from them. International water law is a critical tool for managing conflict and institutionalizing cooperation around these shared resources. Yet, institutionalized transboundary water cooperation remains fragmented and underdeveloped. Fewer than half of these basins have an international water accord, and only about one-fourth of accords include all basin states. The UN Watercourses Convention, which entered into force in 2015, encourages several good-governance principles and promotes best practices, including information exchange, prior notification of planned projects, environmental protection, and peaceful dispute resolution. Signing and ratifying the Watercourses Convention would give the United States a stronger voice in diffusing these principles to basins around the world and should be a priority for the next Congress. The convention has been ratified primarily by states in Africa and Europe, not coincidentally, the two world regions that have made the strongest advances in transboundary water governance, cooperation, and law. Promoting ratification across the Americas and in several key basins in Asia is essential if the accord is to be an effective tool. Model such behavior in the United States’ own practices, including water-cooperative arrangements with Mexico and Canada. Water scarcity can, under certain circumstances, lead to direct conflict over limited supplies. But the far greater conflict risk in most cases is that steps taken to adapt to changing water availability – new infrastructure, new rights of access, new pricing provisions, new rules on land use – are highly contentious, particularly when implemented with a sense of urgency or when lacking democratic procedures of legitimization. It is essential that U.S. engagements to improve water access, water management, and water cooperation, which may increase in response to climate change, all be done in a conflict-sensitive manner. USAID’s Water and Conflict Toolkit provides an excellent project- and program-level screening tool to make sure that efforts are conflict-sensitive. The same logic of conflict-sensitivity screening must be applied to non-project initiatives, including efforts to promote legal and financial reforms in national water sectors, support for public-private partnerships, and the funding streams of intergovernmental organizations in which the United States has a voting share. Ken Conca is a Wilson Center fellow and professor of international relations at the School of International Service, American University. Sources: Global Witness, U.S. Department of State. Photo Credit: A USAID-sponsored water treatment system in Kasekulo, Uganda, has helped reduce illness, courtesy of USAID.